Isole is an epic doom metal band from G?vle, Sweden that is currently signed to napalm records. Isole started up under the name Forlorn back in 1990 with two sole members Crister and Daniel. Some demo tapes were recorded under the 90's. Then the band went into hibernation a couple of years mostly because troubles with members quitting or living elsewhere. In 2003 record label I Hate Records contacted them and wanted to sign Forlorn, and we wanted a fresh start after the hibernation and changed name to Isole. A debut album "Forevermore" was released in early 2005 and was followed up with a 7" "The Beyond" in the beginning of 2006. The second album "Throne Of Void" with a little bit darker sound than the critically acclaimed debut "Forevermore" and was released summer 2006. In 2008 they released the utterly slow and mournful "Bliss of Solitude". 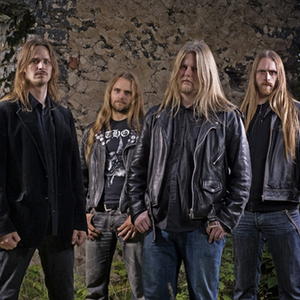 "Silent Ruins", out February 2009, is their second album released by napalm records. "Silent Ruins", continues to forge forth in the tradition of the previous albums. The swedes once again indulge in their heart-sickened and somber brand of doom metal that only finds solace in a perfectly placed portion of deadly black epic. Profound compositions, hypnotic arrangements, and heavy flowing riffs, that not unlike molten lava slowly yet inexorably pull the listener down into its depths, are the core elements comprising this album. Gustavo Sazes (Firewind, Serenity) once again lends his artistic know-how to graphically convey a feeling of utter despair and isolation, while Peter In De Betou (Amon Amarth, Draconian, Arch Enemy) takes on the darkly work's mastering responsibilities. Rarely before have hopelessness and despair found such an elegant and becoming sound, making "Silent Ruins" a dark jewel that will not only appeal to the die-hard doom metal fan.